the Northern Worker: Fired UPS Workers Win Their Jobs Back! Fired UPS Workers Win Their Jobs Back! 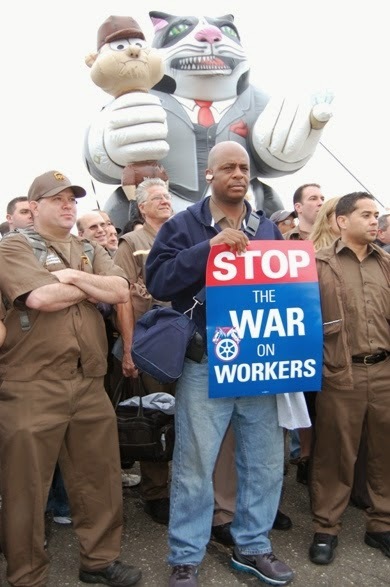 In the wake of a relentless grassroots labor-community solidarity campaign, UPS waved the white flag and agreed to rehire all 250 New York City drivers the company fired last month. The campaign united drivers, elected officials, and even UPS customers. UPS issued termination notices to 250 drivers in March for a 90-minute work stoppage they had carried out on February 26. Jairo Reyes, a 24-year driver, had been fired for starting work too early, and was walked off the job. This violated the Teamsters’ contract, which called for a 72-hour waiting period and a hearing before a worker could be walked off. Reyes will also return to work, under the terms of the agreement struck between UPS and Teamsters Local 804 yesterday. UPS had previously vowed never to back down. The company refused to negotiate with Local 804 and told the press it would boot all 250 drivers as soon as replacements were trained. At first management seemed to make good on that threat. The first 20 workers were fired on March 31, at the end of their last work day of the month so that they and their families would lose their April health care coverage. Four days later, UPS fired 16 more drivers as their local president prepared to take the stage to speak at the Labor Notes Conference. But just five days after that, UPS executives from company headquarters in Atlanta were at the table and striking an agreement with the union to return all 250 drivers to work. What Made Brown Back Down? Immediately after the walkout, Local 804 leaders met with the company to try to settle the dispute. Managers shut down the talks after minutes and said they were issuing termination notices to all 250 drivers. So Local 804 launched a grassroots campaign to mobilize public support. First, the union mobilized its own ranks. Stewards and union activists passed out bulletins and petitions to show Teamster solidarity. But the outreach quickly spread to the public in the form of an online petition launched by the Working Families Party (WFP), a grassroots political party of affiliated unions and community groups, including Teamsters Joint Council 16 in New York. Local 804 members rallied on March 21 in front of the UPS hub in Maspeth, Queens, and delivered more than 105,000 petition signatures to the company. New York City Public Advocate Letitia James and city council members joined the rally. So did Assembly member Michael Simanowitz. No labor radical, Simanowitz is a moderate Democrat who represents an Orthodox Jewish section of Queens. But he is also a UPS customer. His UPS driver, Domenick “Dedom” Dedomenico, was one of the 250 fired Teamsters—one with a special back story. Dedom was run over while delivering Christmas packages for UPS. He spent 10 days in a coma and another 13 months recovering from a traumatic brain injury. A supervisor assigned to monitor Dedom for a day reported that customers were slowing him down to welcome him back on the job, and breaking into tears. Management responded by suspending Dedom and telling him to pick up the pace. Brown’s ultimatum? Deliver one more package per hour or lose your job. Then Dedom became one of the 250 who were issued termination notices. A hot campaign got a lot hotter. Elected officials began scrutinizing UPS’s financial dealings with the city and state, including a sweetheart deal through the Department of Finance’s stipulated-fine program that cuts UPS’s parking tickets by $15 to $20 million a year. UPS responded by firing 20 drivers, chosen at random. Local 804 kicked its campaign up a notch. The union reached out to the press, and the firing of the 250 workers and Dedom, the driver who survived a coma only to be canned by UPS, became tabloid fodder. Local 804 also reached out to other unions while the Working Families Party galvanized support from elected officials. On April 3, fired drivers and other Local 804 Teamsters held a press conference on the steps of City Hall with other Teamsters, nurses, bus and train operators from Transport Workers Local 100, members of the Communications Workers and Service Employees 32-BJ, Laborers, and others. Drivers told their story flanked by more than a dozen elected officials, including Letitia James and City Comptroller Scott Stringer. UPS axed 16 more drivers the following day. Who Speaks for UPS Customers? With political pressure and bad PR on the rise, UPS tried to justify the firings as the only responsible business decision. “We simply cannot allow employee misconduct that jeopardizes our ability to reliably serve our customers,” UPS told the press. The union decided to put the question directly to those customers. Fired drivers launched a customer outreach campaign. They retraced their routes, passed out leaflets, and talked with customers. Customers posed for photos with the fired drivers with signs that said, "What Can Brown Do for Me? Not This" and "Rehire This Guy." Supporters nationwide flooded the corporation with phone calls and bombed the UPS Facebook page. Local 804 made a video of customers speaking their minds to UPS. The testimonials were unscripted and heartfelt and shredded the company’s argument that UPS owed the firings to its customers. “What can Brown do for me? They can give me my driver back,” said Alex Silaco of Tiles Unlimited. Teamsters Secretary-Treasurer Ken Hall, the union’s chief negotiator with UPS, had not issued a single public comment or statement of support since February 26—a fact not lost on Local 804 members or union activists at UPS nationwide. But the day before negotiations with UPS, Hall flew to New York and visited with drivers in Maspeth to offer support to the 250 drivers. The next day, Local 804 leaders, international union officials, and UPS executives met and hammered out the agreement. All 250 terminations were reduced to 10-day suspensions. Local 804 will also issue a statement to members outlining the proper union procedures for a walkout. New York drivers were fed up with long hours, increasing production standards, and constant technological surveillance, Sylvester said. Every UPS truck is equipped with more than 200 sensors that monitor drivers' every move, and drivers are expected to follow 72 pages of “methods,” such as hold the keys in your right hand as you approach your vehicle, start the truck and buckle your seat belt in one motion. > The article above was written by Jane Slaughter and is reprinted from Labor Notes.